Now you are ready to build an executable application that you can share with others. 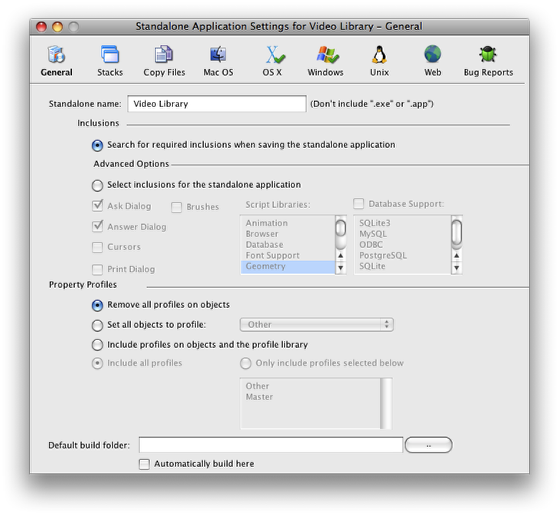 The first step in creating an executable application is to open the Standalone Application Settings dialog for the Video Player Stack. 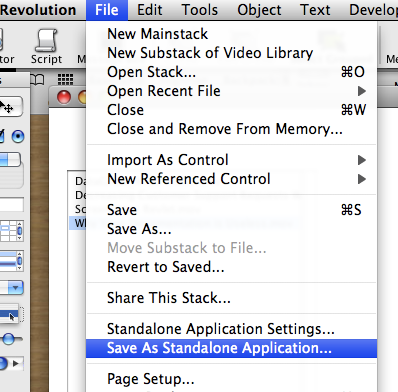 With the Video Player window as the frontmost window choose File > Standalone Application Settings.... This menu item opens the dialog for the Video Player stack. This dialog allows you to configure a number of options for the executable application that you will create. For our purposes the default settings will suffice as Revolution will build an executable for both OS X and Windows. Go ahead and close the dialog using the close button in the dialog title bar. 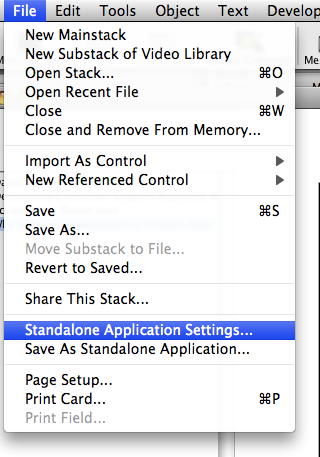 Now that you have configure the standalone application settings you can create an executable. With the Video Player window as the frontmost window choose Save As Standalone Application... to begin the process. 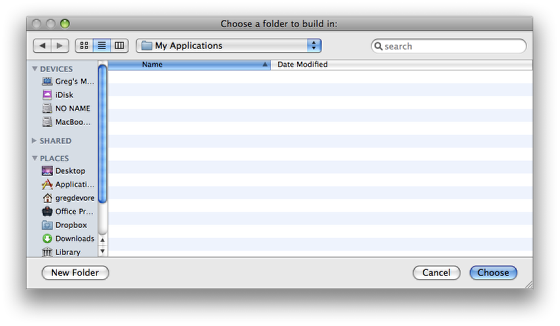 A folder selection dialog will appear asking you to select a folder to save your application in. Select the folder you would like to save to and click the Choose button. If you haven't saved your Video Player stack lately then Revolution will prompt you to save before the executable is created. Click the Save button. Revolution will display a progress window during the building process. When finished this dialog will appear. Click OK. If you look in the folder you built the executable in you will a folder named Video Library (1). In that folder you will find two other folders: MacOSX and Windows. In each of these folders you will find the executables for each platform (2). 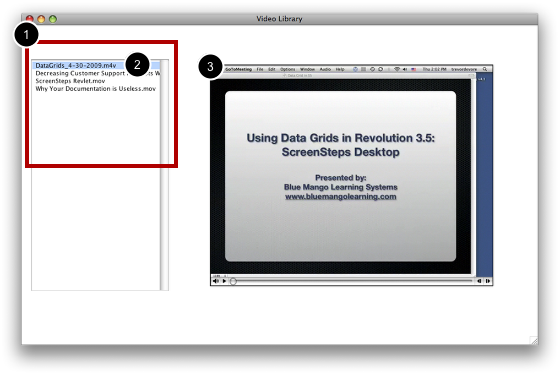 Move the executables for each platform out of the MacOSX and Windows folders and into the Video Library folder. Now copy your Videos folder that you have been working with into the Video Library folder. It should now be alongside the Video Library executables for each platform. You can safely delete the MacOSX and Windows folders at this point. Double-click on the executable for the platform you are currently running on to launch it. 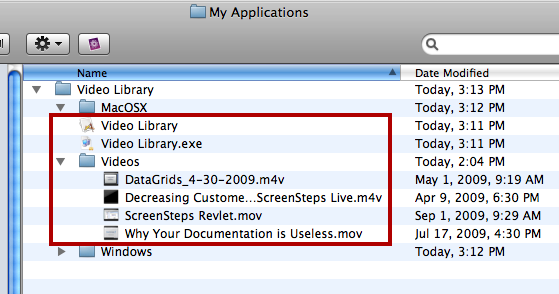 The application should load and you should see the list of files in the Videos folder (1). The first video in the list should be selected (2) and the video should appear in the Player object (3). Congratulations! You just created a Video Player application! A wonderful tutorial. Thank you very much. You have a gift for explaining thing very precisely and clearly. I have a problem. I cannot seem to create a standalone using Enterprise version 4.50-dp-2. I get an error message to send a report to Apple. I can however, create a standalone with Enterprise version 4.0.0. I tried reinstalling Version 4.5. Made no difference. I am running OS X 6 Snow Leopard on an iMac. Any suggestions? But I need to be able to exactly place the player. Different size videos sometimes cover the list window, and them I am stuck because I can't select another video. How can I lock the player position? have you tried setting the dontResize property to false? You should also have tick boxes in the Property Inspector for that control that allows you to fix its location relative to the cards/stack that it is on.